To this end, vintage cookbooks deal with 4 basic breads always baked in a loaf pan, White Bread, Graham Bread, Total (Whole) Wheat Bread and Potato Bread. Any one of these breads would be perfect for toast in the morning, sandwiches at lunch and even dinnertime. 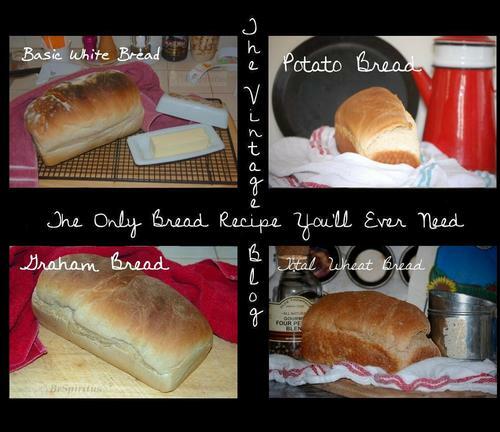 You'll also be saving money sticking with the tried an true loaves. To truly make a cost comparison I have to compare my bread to the local organic baker as we use the exact same ingredients. His bread rings up at $4.50 a loaf while I can bake at home for $1.50 a loaf in ingredients and electricity. "But it's only $3" you say; Well I use about a loaf a week and over the course of a year the savings is $156, quite substantial. Double or even triple that for a full sized family and now you're saving serious money. In a measuring cup mix together water and yeast and let sit until bubbly, about 10 minutes. Sift together flour, salt and sugar then add in yeast mixture. Stir well then work with hands in bowl until it comes together. Add in oil and knead with hands until dough cleans the bowl then transfer to a floured board. Knead well until dough becomes smooth. Form ball and place in oiled bowl, cover with towel and let rise until doubled. Grease a bread pan and preheat oven to 350°. Punch down dough and turn out onto floured surface. If you want larger air pockets in the bread then form loaf immediately and place in pan, for a normal sandwich bread though you'll want to knead it a few minutes then form a loaf and place in pan. Let it rise until it's even with top of pan then bake 30 minutes. Cool on wire rack completely before cutting. Store in plastic bag on counter, will last up to a week but is best if eaten within 3 days. Mix yeast mixture with all purpose flour first before adding whole wheat flour. Takes longer to rise than white bread. 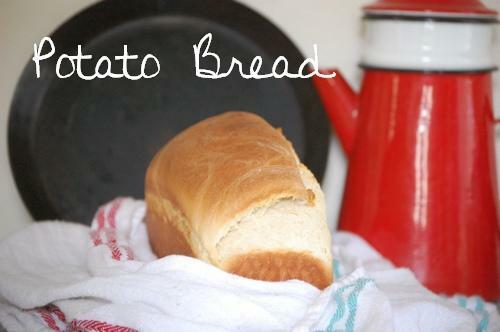 The starch in the potato water makes this a real fast rising bread, it also makes for a moister crumb than with other loaves. Perfect for sandwiches or toasting. 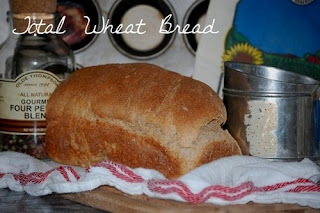 Yield for all recipes is 1 loaf, if more is needed increase the ingredients except for the yeast. I just made the white bread, and it was wonderful! Thank you for sharing these recipes!